Event tree analysis is based on binary logic, in which an event either has or has not happened or a component has or has not failed. It is valuable in analyzing the consequences arising from a failure or undesired event. Event tree analysis is generally applicable for almost any type of risk assessment application, but used most effectively to model accidents where multiple safeguards are in place as protective features. Event tree analysis is highly effective in determining how various initiating events can result in accidents of interest. An event tree begins with an initiating event, such as a component failure, increase in temperature/pressure or a release of a hazardous substance. The consequences of the event are followed through a series of possible paths. Each path is assigned a probability of occurrence and the probability of the various possible outcomes can be calculated. Define the system or area of interest. Specify and clearly define the boundaries of the system or area for which event tree analyses will be performed. Identify the initiating events of interest. Conduct a screening-level risk assessment to identify the events of interest or categories of events that the analysis will address. Categories include such things as groundings, collisions, fires, explosions, and toxic releases. Identify lines of assurance and physical phenomena. Identify the various safeguards (lines of assurance) that will help mitigate the consequences of the initiating event. These lines of assurance include both engineered systems and human actions. Also, identify physical phenomena, such as ignition or meteorological conditions that will affect the outcome of the initiating event. Define accident scenarios. For each initiating event, define the various accident scenarios that can occur. Analyze accident sequence outcomes. For each outcome of the event tree, determine the appropriate frequency and consequence that characterize the specific outcome. Summarize results. 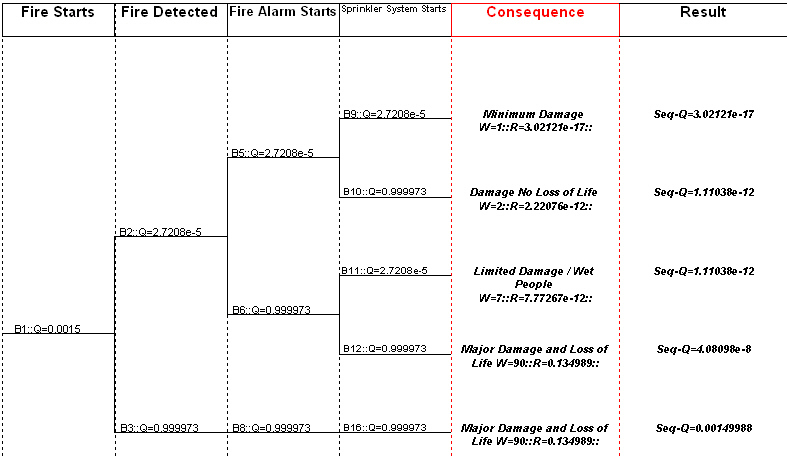 Event tree analysis can generate numerous accident sequences that must be evaluated in the overall analysis. Summarizing the results in a separate table or chart will help organize the data for evaluation. Use the results in decision-making. Evaluate the recommendations from the analysis and the benefits they are intended to achieve. Benefits can include improved safety and environmental performance, cost savings, or additional output. Determine implementation criteria and plans. The results of the event tree may also provide the basis for decisions about whether to perform additional analysis on a selected subset of accident scenarios.